There are two brand new colours coming in the new catalogue which I couldn't be more excited about - 2 lovely new purples!! I have been waiting for some beautiful shades of purples for a few years now! Let me introduce to you - Gorgeous Grape (left) and Highland Heather (right). Just beautiful aren't they? I am still in full swing creating samples for my open day (Sunday 17th June, you are more than welcome to come if you live locally!). This year it's all about the colour refresh so I am keeping my cards simple to highlight the beautiful colours. 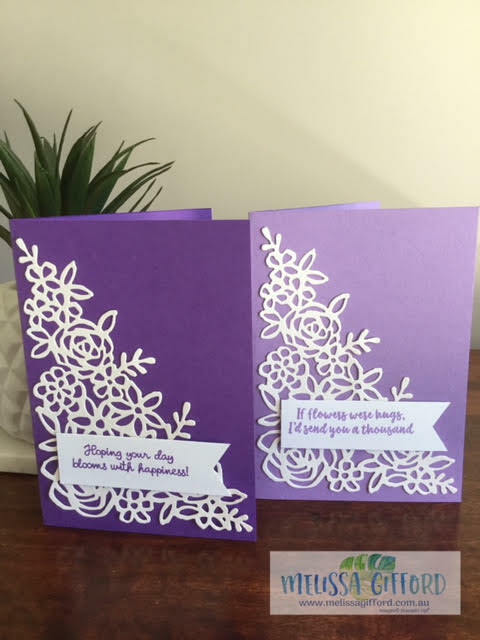 It's very hard to see but I have used Shimmery White cardstock for the die cut flower panel which gives off a subtle shine. I spy a new thinlit die on this card and some new sentiments. How exciting!